This isn’t a particularly original thought but, boy, it sure looks a lot smaller than I remember. It just seems too small to house all those memories, all those holidays, all those meals, all those toys and all those birthdays…and it doesn’t look big enough to contain the big family that used to call it home…one happy couple, one beatnik sister and five rambunctious boys, including one future champion tree-hunter. It’s also missing some trees. There used to be larger roses and more evergreen shrubs guarding the walkway to the front door. There used to be a dwarf pear tree and a rose of sharon on the driveway side of the house. On the other side of the house, there used to be a sour cherry tree. At the end of long summer days, I would cool down under the sour cherry tree with the Lippincott brothers and we would throw our pits over the fence into the neighbor’s in-ground pool, sorry about that. 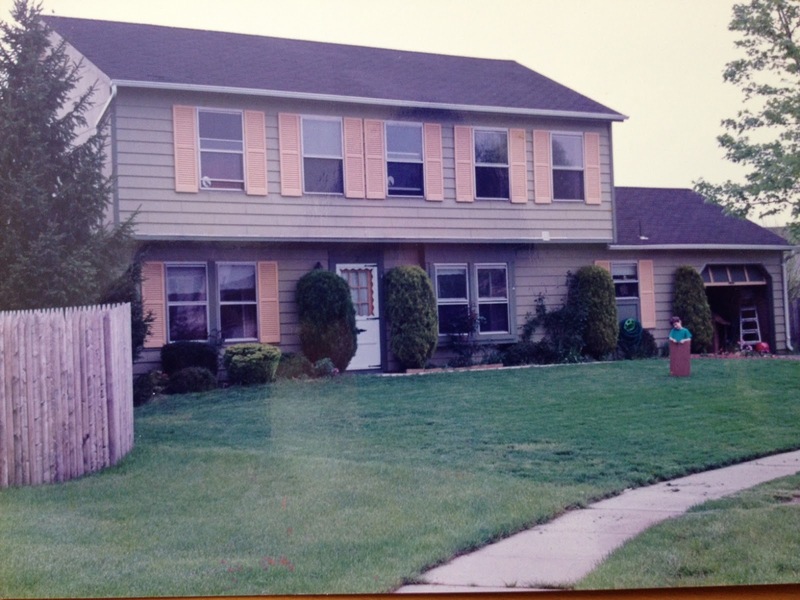 …that tall Norway spruce rubbing up against the side of my childhood home. These are the trees of my past…the trees of yore…the phantom trees that can no longer be found except in old photographs and fading memories…happy Memorial Day, citybillies. Contrary to popular belief, trees do go missing. I wish they wouldn’t move around so much but they do. They come and then they go. 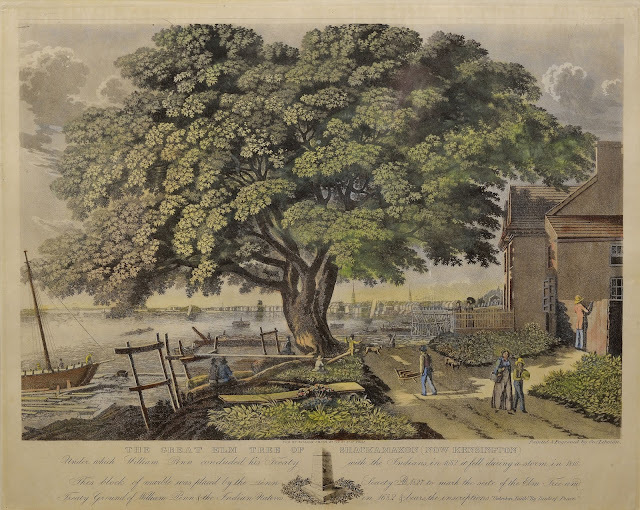 Philadelphia, too, is haunted by its own host of missing trees, none more famous than the Great Elm of Shackamaxon. Shackamaxon was the name of the Lenape village located right here along the Delaware River within the borders of the Philadelphia charter, in the neighborhoods currently called Port Richmond and Fishtown. According to a few histories, Shackamaxon was the capital of the Lenape nation and the seat of power for the chief of the Turtle Clan. In the village of Shackamaxon, there was a great elm. In 1682, under the shadow of this great elm, William Penn made official peace with the chief of the Turtle Clan, a meeting that is known as the Treaty of Amity and Friendship. The king sits in the middle of a half moon, and has his council, the old and wise on each hand. Behind them or at little distance sit the younger fry in the same figure. Great promises passed between us of kindness and good neighborhood, and that the English and Indians must live in love as long as the sun gave light. 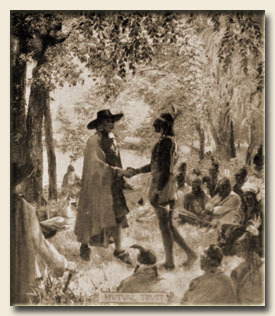 The Treaty was sealed with the exchange of wampum belts. 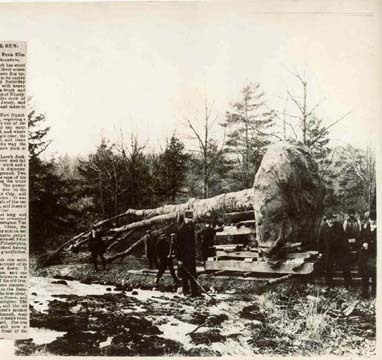 The elm tree, already tall and mighty during this historical handshake, finally succumbed to heavy winds 128 years later, on March 3, 1810. Philadelphia’s most famous phantom tree, long gone but not forgotten, paid respect on the Friday before Memorial Day 2013 by humble old Jon Spruce. It was a blustery, rainy day, smack dab in the middle of a busy holiday weekend. My time was limited. Work was breathing down my neck and, by Jove, it was almost June. I had very little free time. I hate using that phrase. I wonder how you say free time in the Lenape language. Time wasn’t slipping by. That would imply I still had a chance to grab it. Face facts, Jon Spruce. Time was gone. But if I used my remaining time wisely, I could still find some new trees so, in the spirit of Memorial Day, I drove west from Penn Treaty Park, up Spring Garden Street. I swung around the Art Museum down Kelly Drive and took the turn that led to the entrance of the Laurel Hill Cemetery. Like most tree-hunters, I love a good cemetery. This one, the Laurel Hill Historic Cemetery? This is a good one. It’s located on the top of the rocky bluffs that soar above the hairpin curves of Kelly Drive overlooking the muddy Schuylkill River. It was the first cemetery to be designated as a National Historic Landmark and, if you enjoy visiting famous graves, then this is a good place to go hunting. Harry Kalas is buried here. So is Owen Wister, one of the pioneers of western fiction. Witmer Stone is also buried here, the very first botanist to tackle the flora of the New Jersey Pine Barrens. Generals, commodores, composers, explorers, Philadelphia mayors, Continental Congressmen, signers of the Declaration of Independence, all buried here. David Rittenhouse is buried here too. He was responsible for the first American telescope and the first American to find Uranus. What’s the most famous grave here in Laurel Hill? Well, that’s a funny story. It turns out the most famous person buried here never even existed in the real world. This is also a good place to go tombstone reading. As a fan of literature, there is a part of me that enjoys a well-worded epitaph. A good tombstone can contain a superior level of simple, frank poetry. Etched into stone, an ordinary turn of phrase has the chance to reach high craft. …who just fell asleep one Sunday in May, 163 years ago. …was one of the best mediums of her time. …we meet upon the level, and we part upon the square. Now I make it a general rule not to go messing around with the Masons but I sincerely hope that they all enjoyed Miss Drinkhouse’s company for more than just her clairvoyant powers to communicate with the dead. I mean, c’mon. A medium in heaven? I can’t think a more worthless occupation. I suppose, up there, there isn’t much demand for a good gravedigger. Tombstone reading is fun, I admit, but I was here to find new trees and, in that respect, Laurel Hill, again, does not disappoint. Laurel Hill was always meant to be more than just a cemetery. John Jay Smith, the site’s first planner, wanted the place to be a showcase for architecture, landscape gardening and botany and he had over two thousand trees planted on the cemetery grounds. Some of the big trees here might've been planted by John Jay Smith himself, they look so old and so worn, so established in their place. …flexing its muscle over the grave of one Charles Hyneman and his wife Annie Chance. …red, rainy roses gracing the grave of Rebecca Clifford Fox. …a black road awash in golden pollen. This normally means that there is a healthy, fertile honey locust nearby and, sure enough, I found it. These are the flowers of the honey locust. In the fall, the tree will produce those large, dark, twisted bean pods. Somewhere still undiscovered by me, there is a pathway between these delicate flowers and those thick bean pods. I suppose I could find that path but, in order for my feeble mind to understand, I would have to take a picture of its transformation every day. That’s the only way I could follow that route. As promised, the cemetery is rich in rare trees, especially the yellowwood. The yellowwood has a very small and limited native range, found only on the rocky, limestone cliffs found in certain parts of Kentucky, North Carolina and Tennessee. It is rare even there. …and is a good example of its distinct habit of branching too close to the ground. …which, for some reason, attracts a universe of moss and lichens. Another rare tree stands tall and proud over the grave of Caleb Horne, his wife Anna Mary and their daughter, Phoebe. …large bushels of small flowers that, like the honey locust, will eventually transform into a thick, brown bean pod. I found some on the ground, leftovers from last winter. …although those beans can be roasted and ground to make something that kind of tastes like coffee, a trick used by the Native Americans and the origin of the tree’s name. This is a good place to go tree-hunting but eventually the scenery will dampen the adventurous soul. The rain wasn’t helping. Even with a dauntless and intrepid spirit, the cemetery’s population has a way of catching up with you. An unsettling sense of the morbid and the macabre began to cloud my heart and rattle my walking bones. And what, in his mind, was the difference between life after death and the hereafter. As someone who is obsessed with the notion of here, I was suddenly struck by the odd and sinister implications of that combination of words, hereafter. The Lenape might’ve understood what he was talking about. They buried their dead in a fetal position. And, like most religions, the Turtle Islanders believed that there was a passageway from this world to the next, but they didn’t imagine that passage as a sunny tunnel or as a light ascension towards cloudier climes. They didn’t believe in some simple, quick flight up to heaven. They imagined it as another leg of life, a long journey, fraught with danger and teeming with enemies. For them, it will be high adventure. It will begin at the spot where you were buried. After collecting the totems that were buried in your grave, you will walk a path through a cascading landscape of ditches, ravines and gulches. The sky will be both night and day. The sun will burn bright and hot, the moon will do the same. The constellations will be unfamiliar. Shadows of giant birds will cross your path as you scramble over the high cliffs and walk along the red ridges. At the end of this landscape, you will come across an impossible canyon, a roaring river miles below. A rickety rope bridge will be the only way to cross the canyon but, half-way across, the river will rise and try to destroy the bridge. Its waves will break the ropes, splinter the boards and yap at your feet. Making it to the other side, you turn around. That’s when you notice that it’s not a river. You'll continue down the path. You will have to wend your way through a tight tangle of willow, hazel and thorny rose. The woods will be thick with rabid frogs, slimy worms, bloodthirsty deer, angry bears and evil birds whose songs tempt you into turning around and giving up. When you’ve finally cleared the woods, you will have to pass through a land burning with fire. The whole time, you’ll have the feeling that you’re being followed. Along the path, there will be food. In most legends, it will be fields of ode-e-min, which translates to heart-berry. We know it as the strawberry. They will be as big as boulders and some will be poisonous. Only those who paid attention to the teachings of their elders will be able to tell the difference. Finally, you will come to the land of spirits. You will climb a ladder and you will find a long lodge with walls made of whaleskin stitched together with deer antlers, fragrant smoke pumping out of the many cedar-wood chimneys. There, you will meet the Mother of the Mountain. She assures you that all the trials are done, all the tribulations passed. She promises that you are home and, at first glance, you agree. This place? It looks exactly like the world you’ve left behind. She will feed you salmon and dried bear-ribs, acorn pancakes, sweet potatoes, corn, berries and coffee. After the meal, you’ll continue up the ladder to stand in the presence of the Earthmaker. You can stay in the Afterworld, in a place identical to your original village and peopled with the entire lineage of your tribal tree. Or you can be born again to this world, the real world, for one more wild ride. And this is the part of the myth where I always lose my footing. These two choices have always befuddled me. Both worlds, at first glance, seem to be the same. Same animals, same landscapes, same food, same trees, same tobacco. Mountains, rivers, woods, canyons, lakes, stars, sun and moon? All the same. In the end, same people too. Even the people you’ve left behind on the real world will, ultimately, catch up with you in this spirit village. But, if you think about it, there are two stark differences. This will be the deciding factor in your choice. In one world, you will have to face death again, and again. In the other world, there will be no cemeteries. So many wonderful photographs. I haven't seen a yellowwood or coffee tree in a long time. You illegally took one of the pictures from my website and inserted on yours. My website very clearly specify that all materials including any and all photos a copyrighted and you’ll need a permission to use them. Ether you remove my picture immediately or give a credit including “live” link to the source. If not complied other actions will be taken. What a neat story - I have been to Fishtown but had not seen the William Penn statue, nor did I know the story of the great elm. Thanks for narrating all this. So glad you liked the story! The history of Philadelphia is full of trees. All this is perfectly distinct to an observant eye, and yet could easily pass unnoticed by most.